With Valentine’s Day fast approaching, many men and women are trying to decide how to make it special for the one they love. In truth, what many women (and men) really want is pretty simple – breakfast in bed, some quiet time and snuggling with the ones we love. 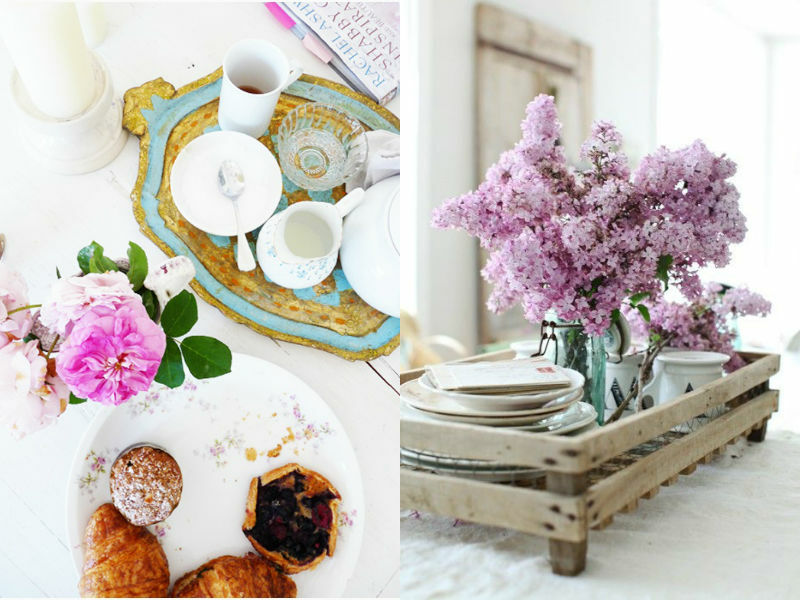 Having a beautifully arranged breakfast, served in bed, sounds like heaven to most of us. It’s a morning without obligations. For me, there is nothing more wonderful than being served breakfast in bed by the man I love and then snuggling in with my two best guys, my husband and my son. So, how to prepare the perfect breakfast in bed for that special someone? The perfect breakfast in bed requires a few main ingredients: a tray with beautiful dishware, coffee and juice (or mimosa! ), an enticing food selection, maybe a bud vase with a fresh flower and a special note. Including a favorite magazine or newspaper is also a great personal touch. Everyone has a breakfast favorite and having it made just for you is what makes it truly special. The presentation is also important. Serve the coffee in a mug, juice in a glass, and food on ceramic plates/bowls, and opt for a fabric napkin versus paper. It may sound cliche, but no matter what you make or how you serve it, it is truly the thought and effort that counts. Your loved one will be thrilled you took the time to prepare a lovely breakfast in bed for her to enjoy. 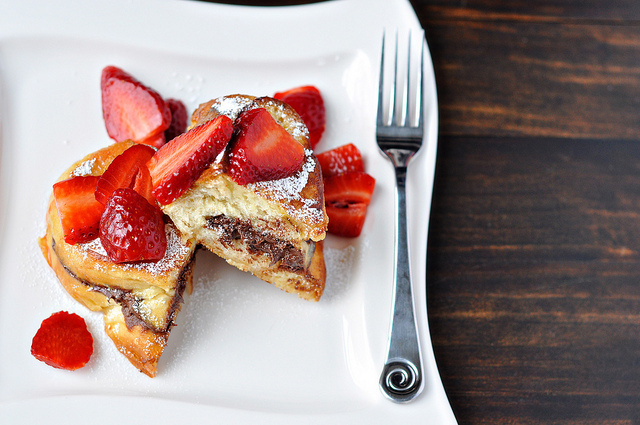 Above is a recipe I ran across on Pinterest for Stuffed Nutella French Toast with Strawberries. Not only did I want to immediately run to the store, buy the ingredients, and make it for a mid-day snack, I also thought, “What a perfect breakfast item for Valentine’s Day!” The photo makes the french toast look blissfully decadent with soft challah bread, rich Nutella and sweet strawberries. Topped with powdered sugar and paired with maple syrup, this recipe will make for a beautiful and delicious breakfast in bed. Find the recipe here. I also selected a few products from Demi Ryan to get you started on a lovely presentation: the perfect mug for a cup of coffee, the right-sized bowl for a side of fruit, and shallow bowl to contain the syrup on the french toast. A tray is a must-have for any breakfast served not at the kitchen table, and kind words written on a notecard or a piece of art will seal the deal. 1. Sugarboo Everyday I Love You Art: With heart-felt words in bold color against a subtle background, this print reminds all who pass through the room that they are loved. Comes ready to hang in a reclaimed wood frame. A perfect gift to compliment a lovely breakfast. 2. Dessau Nickel Tray Rectangular w/ Bamboo Handle: With an almost-mirrored sleekness of polished silver metal contrasted with bamboo handles, this tray is perfect for serving a full breakfast in bed to your loved one. 3. Vietri Sorbetto Aqua Footed Mug: This Sorbetto Aqua mug is perfect for morning coffee! 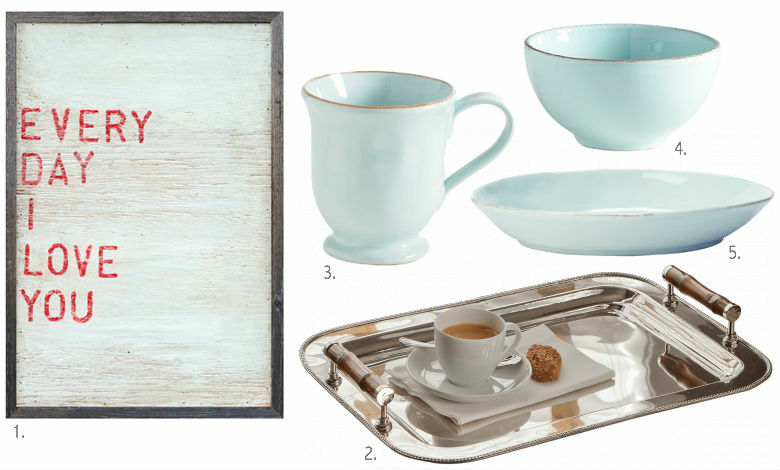 The soft blue glaze and deckled edges will give your tray a wonderful rustic look. 4. Vietri Sorbetto Aqua Cereal Bowl: The Sorbetto Aqua cereal bowl is perfect for serving cereal, oatmeal, fruit, or any other breakfast side item! 5. Vietri Sorbetto Aqua Small Shallow Oval Bowl: The Sorbetto aqua small shallow oval bowl is another foundation piece from the Cucina Fresca family. Just the perfect size to serve french toast, pancakes, or the traditional breakfast trio of eggs, bacon, and toast. All items in the Sorbetto collection are handmade in Tuscany.